The JNBK Sμ Sports Pad has been developed to improve the overall braking power, specifically for performance street vehicles. With dependable braking performance and improved anti-fading features, Sμ Sports Pad produces relatively less dust and noise, which exceeds the braking performance of most OEM brake pads. It is designed to upgrade standard brake pads for street sports use. High performance vehicles demands high performance braking elements to meet the braking standards. JNBK studies closely to the drivers’ requirements and has developed the new generation of high-end brake pads. 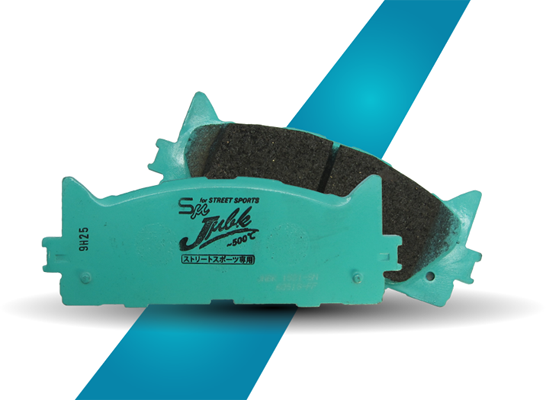 JNBK μSport brake pad series have been formulated with ceramic carbon compounds to endeavour improved overall braking power and boost the drivers’ confidence especially when controlling the vehicle on winding roads at high speeds. JNBK μSport brake pad series are manufactured specifically applicable for a wide range of calipers, especially Japanese automotive. The surface of the friction material on the brake pads are scorched, that is to conduct heating over a period of time. Non-essential materials are removed through this process which improves the bedding-in process and increases pad efficiency. The friction material has been chamfered to prevent brake squeal, a high frequency vibration produced by friction. It also improves the durability of the brake pads. Brake squeal is more likely to occur in some models, and not all. However, the condition of the vehicle is also a factor to brake squeal. ■Available for a large number of standard calipers and aftermarket calipers. ■Refurbish of old back plates with JNBK sport pads friction material is available. ※Please contact us for vehicle availability. JNBK is officially registered since 2003. Copyright © JNBK-Brake | All Rights Reserved.